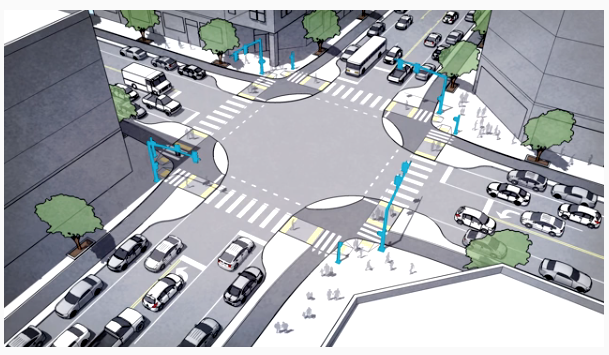 This week we learn about 6 Intersection Designs That Actually Prioritize Pedestrians, which Syracuse could probably benefit from since 'I cannot walk anywhere': Correspondence on the sad state of 'walkability,' in greater Syracuse. Elsewhere in New York, they're contemplating Vision Zero and the Challenge of Culture Change at NYPD and a Walkability project discussed for Downtown Brooklyn, while Centerville buys into I-15 pedestrian bridge, Active Trans Launches a New Crusade Against Dangerous Intersections in Chicago, and After pedestrian deaths, Mountain View asks residents to suggest traffic fixes. After all that bad news, it's a good thing La Mesa gets grant for pedestrian, bicycle safety. As we continue on The march to walkability, Nashville Mayoral Candidates Mull A More Walkable City and New Efforts Under Way To Improve Pedestrian Safety In Philly. Things aren't looking so great in LA, where Metro Moving Forward With Flawed Complete Streets Policy, or in Florida where according to one Engineer: State DOTs have ‘blood on their hands’ because lanes too wide. And it's not just roadways; Critics Say Railroads Should Do More To Prevent Pedestrian Deaths. Closer to home we wonder Could Tulsa be the next Portland? If so, maybe they need someone like this Metal artist decorates pedestrian walkway. Looks good to me.